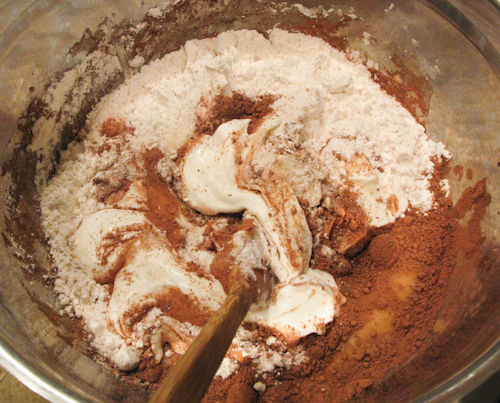 Combine the flour, sugar, sour cream, eggs, cacao, and condensed milk in a large bowl. 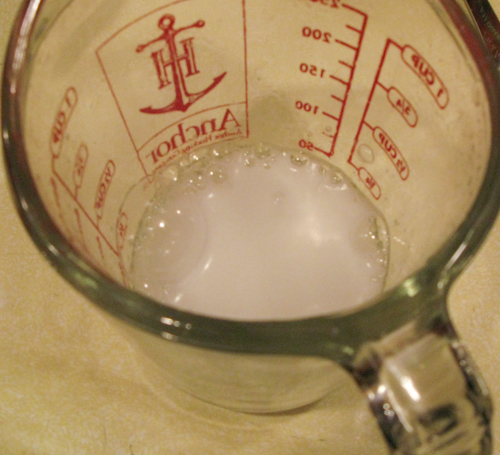 Put the 2 tsp of baking soda into a glass, pour a quarter of a cup of vinegar over the baking soda and stir vigorously. 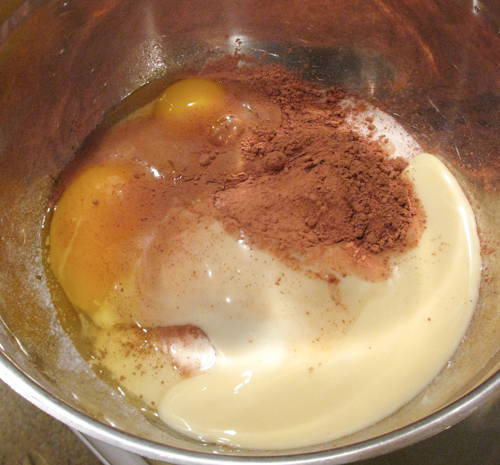 Quickly pour the mixture in with other ingredients and mix thoroughly together. A mixer is really not required for this. 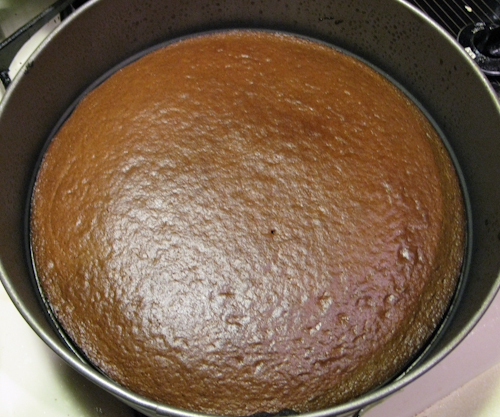 Grease the round cake pan and pour about 0.5 inches of batter into it (about half the total mix), spread it around evenly. Place into a 375 F degree oven and bake for approximately 17 minutes or until done (sticking a toothpick into the center brings nothing out). 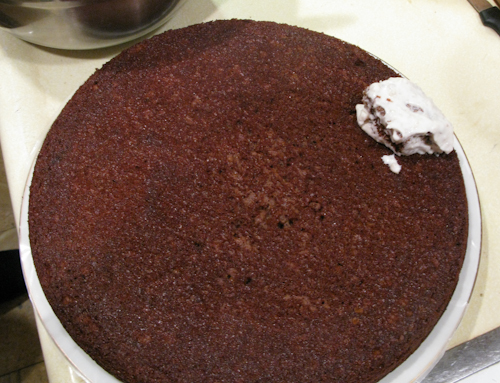 The round part will be the base of the cake, so let it cool before touching. 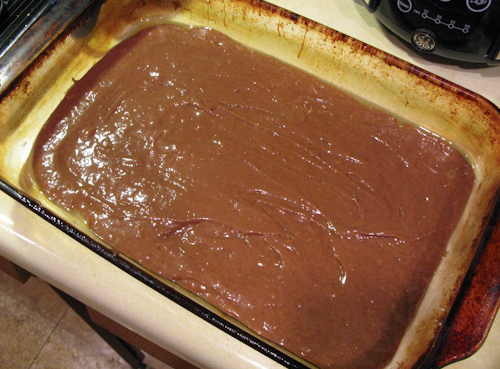 Take the remainder of the batter mix and pour into a greased casserole dish or any other square, oven safe dish. This should be a thin layer (0.5 in or less). Bake for approximately 10 minutes or until done. In the meantime, make the cream. 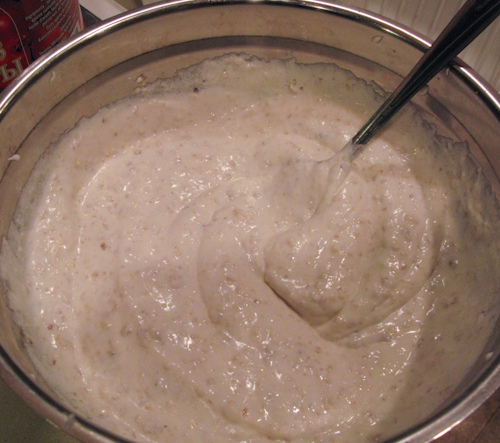 Just combine the walnuts, sugar, and sour cream in another bowl and mix until an even consistency. 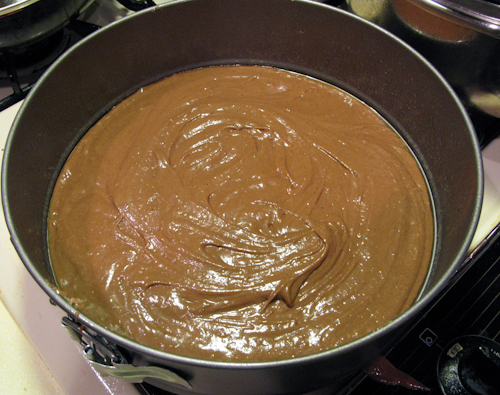 When the second batch of the batter is done baking, let it cool for 10-15 minutes or until it’s cool enough to work with. 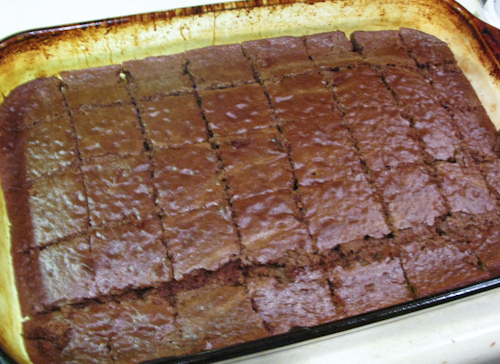 Cut the batch from the casserole dish into approximately 1 inch squares. 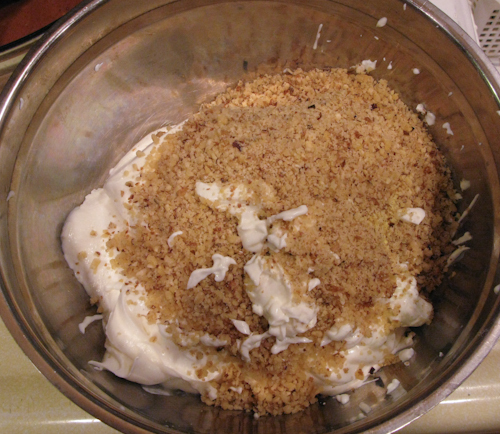 Starting with the largest square pieces in the middle, pull each one out and dip in the cream you made previously. Completely cover the square pieces in the cream, and start laying them out in a circular pattern around the rim of the round base. Keep laying out the squares until the rim is complete. Then fill the center with the remainder of the square pieces. 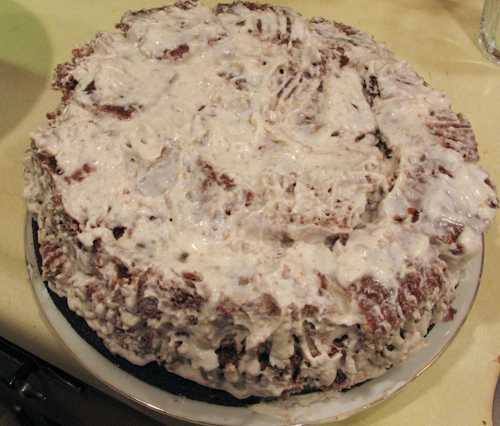 We wanted to make a larger cake, so we made another batch of the batter using half the specified ingredients and added another layer to the cake. 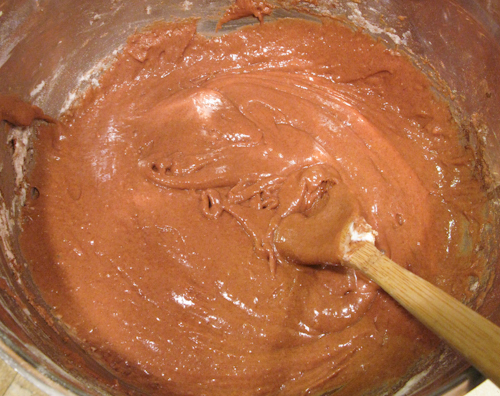 Then simply cover the cake in chocolate frosting (microwave it for 30 seconds to make it easier to decorate the cake). 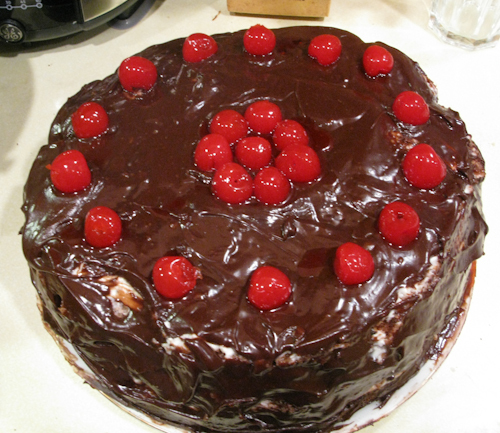 Garnish with cherries or nuts, and chill the cake at least for a few hours. Posted in: Dairy, Desert, Holiday, meat-less. I don’t think I’ve ever tried this cake but it looks very good. I will be trying this recipe out soon. Thanks for posting it. Its so hard to find good russian cake recipes online. We used store-bought chocolate frosting. You can certainly make your own, and I remember we have before when I was younger. But we “cheated” a little on this one. This looks really delicious! I will try this recipe out this weekend. For the cacao, do you just use a natural coco powder like Nestle or Hershey’s or do you use a Dutch-process powder? Thanks! 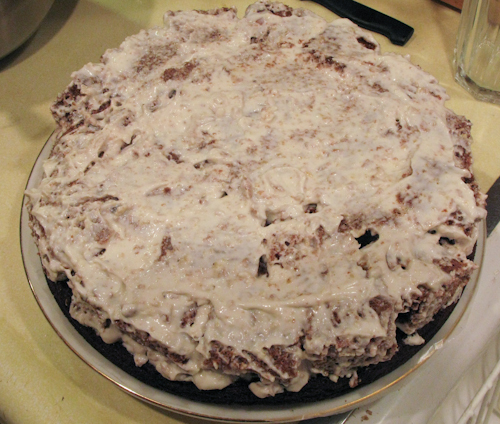 We used Hershey’s cacao powder when we made the cake. Good luck.